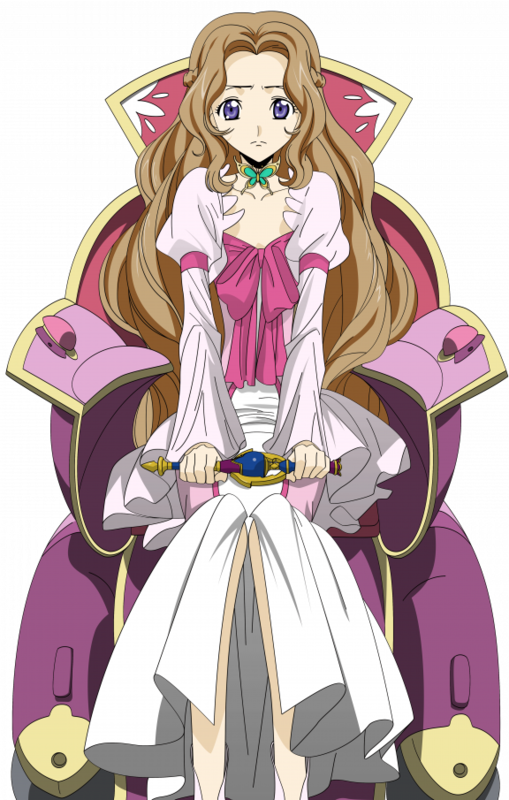 Nunnally, were she to stand, would be just a little under average height and, an early bloomer, she has no growth left in her. She has a thin, almost frail-looking build, with long-looking limbs and narrow shoulders and almost no bust to speak of. She has a narrow, almost pointed jawline and a small pert nose. Her eyes are a dark blue, often not quite looking toward the people she's speaking with, though she tries to get as close to making eye contact as she can manage without being able to see. When not dealing with other people, or when deep in thought, she'll often close her eyes and pretend to herself that's why she doesn't see, simply because her eyes are closed. Her hair is rather impressive: light brown, down past her hips, thick, and wavy. She keeps a part tied back to keep the rest of it from getting in her face and mouth. She's proud of it and how soft it feels, and takes some great pains to ensure it stays that soft. It helps when people call it pretty, too. She likes to feel pretty, even if she can't remember what that looks like. She wears a lot of pink, because that was her favorite color back when she could see. She also favors frilly dresses, no matter how impractical it may be. It's not like she's running about anyhow. Though she tries to smile often, she's also a master of the sad puppy dog face when she isn't quite getting her way. Nunnally is a sweet girl whose innocence was stolen from her young. She knows that the world can hold many horrors, but she prefers to pretend those don't exist in favor of wishing for the world to be a better place. She tries to at least to pretend to be strong, even when all she really wants to do is wilt away from the world and cry; she vowed Turns ago not to cry any more, lest the people she cares for worry. That goes triply for Lelou, who she cares for greatly, and she wants him to get all he desires even if there are things neither of them can ever get back. Despite not wanting others to worry, she carries plenty of worries of her own. She worries that she isn't helpful enough, that her knitting isn't especially useful or good enough. There's little else she can do without being more of a hindrance than a help. She's also somewhat convinced that she may be cursed, because bad things keep happening around her and there's nothing she can do to stop it. Her mother dying, her and Lelou’s banishment to High Reaches, the war, deaths in Threadfall… What if she is, in fact, the root cause of it all? She has more than a bit of a sweet tooth, and is especially fond of chewy candies and cake, even if she can't get them often. Sweets are probably the one thing she's not especially willing to share, though if Lelou were to ask she'd share even her favorites. Nunnally, as a small child, was the clingy sort. She was one to squall loudly if she was set down, to fuss endlessly if she wasn't being cooed over and held and generally loved. Her mother hoped she'd get over it when she got on her own two feet, but she just ended up clinging to her mother's skirts and toddling along after her, refusing to leave her side. She was in every way a little mama’s girl, intimidated by most other people. She was always around while her mother worked, and this was never seen as an oddity. So when a shipment of firestone arrived for the little cothold to deal with bagging for the Weyr had other things to do, nobody questioned it when she tagged along with her mother. There was only one problem. It wasn't firestone. And when the sky opened and it began to rain, the flamestone did what that close cousin rock always does when exposed to water: it exploded. Nunnally was thrown bodily through the air along with her mother, who had managed to shield her from the worst of the blast. However, even so the damage had been done. Nunnally’s legs had been all but crushed, and a blow to her head at some point robbed her forever of her sight. She wailed for days, mostly from pain, but also because her mama wasn't there and she couldn't understand why she wouldn't come to her. She couldn't understand why it was always dark, or any of what was happening. Only that her siblings came to talk to her sometimes, but it was hard to hear anything but fuzzy muffled voices for the first few days, though after that they became clearer. Still her mama never came. She cried for that fact a lot. As is the way with very young children, Nunnally slowly forgot everything she'd ever known of having a proper, real family with a mother and a father and siblings. She had only the faintest memories of her mother, and couldn't have said what any of her siblings looked like. She forgot flowers, and the sky, and her family's faces, and for that too she wept. In fact, she cried at almost everything for Turns. When her siblings other than Lelou were sent away for reasons she never understood, she cried. She cried when it rained, and when it was too hot. She cried when she wanted to play with the other children but couldn't. And she cried when she and Lelou were sent to a strange place without any of their family, and she didn't know why. Eventually she stopped. She began to notice how others changed around her. Their voices dropped in volume, but the tones increased in register. They would shuffle their feet oddly in ways they wouldn't when they didn't notice her. They worried about her, the broken girl who couldn't see and cried endlessly, and so she stopped. She wasn't going to make anyone worry again, least of all Lelou. He was the only family she had left, and she wanted him to live for himself, not to worry about her. She tried to find ways to be useful. Knitting was nice, so long as she had help picking colors. The rest of the Weyr all but passed her by. She came to know that she and Lelou were at the Weyr because of something their father had done, but she found she had so few fond memories of him that she didn't really mind. Her brother did, though. Even she could tell that he chafed against being held there, and she tried her best to cheer him up. Knitted scarves, and warm socks… Anything to make him forget even for a few minutes that he wasn't where he wanted to be. Because she was happy there, so long as she had him. One winter, she was given a fire lizard egg which hatched into a fierce little blue who would have done anything to protect her. From everyone. Including, and perhaps especially, Lelou. The blue took an immediate, irrational dislike toward him that continues still, though he's tempered his attitude toward other people. Her brother, however, he will still his angrily at and attempt to bite if she doesn't control him. Feels extremely betrayed that Lulu has gone to Semaca to stand for a clutch, leaving her behind. Alone. Has gotten a lot more friendly with Schneizel... and sees absolutely nothing wrong with that. Buddy is a rather brawny sort of blue, with short squat legs and a stubby tail, but muscle to make up the difference. His hide is a dark, rich blue with splatterings of teal that make it look like he was perhaps briefly showered by a strange rain of paint, for the splashes are only on his upper half. His legs slowly fade into an even darker blue, broken only near his ankles by what looks like pale blue bracelets. Buddy is a proud, strong little blue who is utterly devoted to Nunnally. Any threat against his human, no matter how small, is personal to him. He's taken to stealing any knives and removing them if she sets one down at a meal, and it's taken all she can do to keep him from stealing her knitting needles in an effort to protect her as well. Most people are tolerated so long as they don't make any sudden movements though, and he's even somewhat friendly once he grows comfortable with their presence. For most people, at least. For Lelou, Buddy has a strong, irrational hatred. The blue usually has to be sent out of the room entirely when he's around, because he will do nothing but hound and harass him to attempt to keep him away from his human. Buddy likes food, but cannot be bribed with it. He sees such things as beneath him. He likely believes he should have been a bronze, but was instead born with a blue hide. He takes orders from no one but his own human, and especially resents it when other fire lizards try to boss him around, which luckily isn't often. Dragons and whers haven't yet tried, but he would tolerate that as well as he would the others: which is to say, he wouldn't tolerate it at all.